Newbie needing advice regarding whole house set up. This is what I have. I currently use Windstream (DSL) as my ISP. I have one phone with wireless hand sets (no problem). My question is around my DirectTV Satellite receivers. I have 3 DTV HD DVR's in different rooms, each plugged into the phone line for download and On-demand capability. What do I need to do/buy to keep the satellites connected via phone lines? Can the Ooma "power" the phone lines for the whole house? If so, do I need to get rid of the DSL and go cable? No fiber available. I connected my Ooma yesterday and so far so good, but I have not yet turned off my phone service. I plan on relocated the Ooma over by phone base and connecting it to the network via Ethernet Powerline Adaptors. Is your phone & DSL on the same wire pair L1? If you didn't have phone service anymore but just DSL, then at the NIB outside your house, you can have the DSL come in the house via L2. Just modify 1 wall jack to use L2 and connect up your DSL modem. L1 which most, if not all your house jacks are wired to will be available for you to distribute the Ooma dialtone. Make sure L1 is not connected to the telephone company at the NIB, connect "phone" port of Ooma to any wall jack (L1) and you'd have Ooma dialtone everywhere in your house. Set the receiver to dial out with prefix *99 and put a DSL filter between receiver and wall jack to maximize successful dialout. I'm not sure, but I will see if I can determine that when I get home. It is a newer home (5 years), in a nice neighborhood. So, would the Tel co typically have both a Line 1 and Line 2 run in the house? I know I have to use filters on every jack that needs to use the phone service. Plan A is to keep the DSL and try to implement the whole house solution. Plan B is to drop the Tel Co completely and get Comcast Internet only in the house. I'm not a Comcast fan, so I try to implement Plan A first. Will check back after I examine the NIB. If you got filters everywhere there is a phone, that means you have DSL and phone on the same pair. if you remove the DSL modem from the jack and plug a phone in, the phone should work; this is how you can confirm. OK, so assuming I have I only have one Line (same pair? ), is there a way to distribute the Ooma dial tone in the house with DSL? Or would I have to switch to Cable Modem? Somewhat related, I wonder if it is possible to have both Powerline Ethernet Adaptors and Wireless Phone Jacks on the same power grid? You can keep DSL and distribute Ooma dialtone in your house. Suggested is use L2 for DSL and L1 for Ooma. I'm in a 20 year old home (in a nice neighborhood ) and a telephone wire with 3 pairs was run throughout the house to connect all the wall jacks. Only line 1 (L1) was used, so L2 and L3 were available for me to use. In my home it is one long piece of wire that connects all the wall-plates. Newer homes will typically run a single wire from each wall-plate back to a common location where a structured wiring device (I think that's the right name) will allow customization of how the house wiring is used. With a 5 year old home, you most likely will have the pairs your need. I have additional information. Firstly, I called my DSL ISP (Phone co) and they informed me that when you discontinue phone service they leave your phone number intact and functional. They just charge you by the minute if you make a non-Toll free call. There was no option to completely turn off phone service, while keeping the DSL. Will this effect the the recommended solution? Secondly, I feeling a little embarrassed with my lack of understand of telephone wiring. Can you define what a pair is? Is it simply a pair of wires. ".... you can have the DSL come in the house via L2. Just modify 1 wall jack to use L2 and connect up your DSL modem." Exactly how do have the DSL come into the house via L2? How do modify the DSL wall jack to L2? Here are a couple of photos of my NIB. The phone company is just trying to sell you their basic phone service which is not necessary. You just need DSL (or any other internet service) to make Ooma work. If you port your number over to Ooma and your DSL service gets interrupted, you just need to call the phone company to have them turn DSL back on (they don't need to make a service call; they can just turn it on remotely). Looking at your NIB box, L1 is connected to the phone company. White with blue is connected to the green screw terminal and blue with white is connected to the red screw terminal. 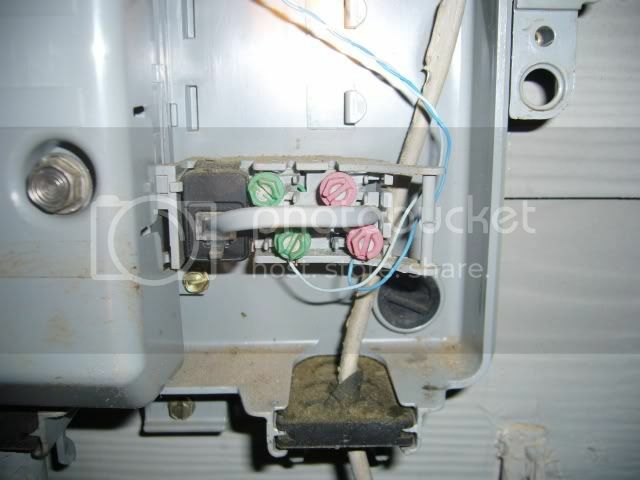 To have L2 connected to the phone company, just find the orange pair from the wire bunch where the L1 comes from and connect white with orange to the green screw terminal and connect orange with white to the red screw terminal. 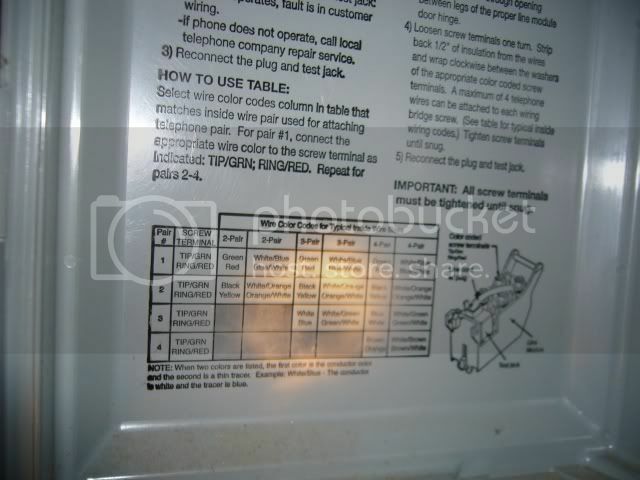 Before taking L1 off the screw terminals, just unplug the plug next to the screw terminals (this will disconnect the screw terminals from the telephone company). After you connect L2 to the screw terminals, plug the plug back in. After you connect L2 to the screw terminals, clip the exposed metal leads on L1 and leave them as they are (don't connect to anything). Just plug this splitter into a house wall jack and plug your DSL modem into the L2 port of the splitter so your modem would work. Then you can feedback Ooma dialtone to all the wall jacks in the house by connecting the Ooma "phone" port to the L1 port of the splitter. lbmofo, Thanks for all you help. I think the fog is clearing in my mind. The terminology is still somewhat confusing, with the white with blue and blue with white?? All I see is a blue wire and a white wire. I assume the blue wire has a white stripe and the white wire has a blue stripe, but it was night and sleeting, when I took the pictures. I will go re-verify that this evening. Basically, I need to do the following steps. Please verify one last time to make sure I got it right. Can I do all this while the phone service is still turned on? If so, once I'm sure it's working I will call the phone company and "turn off" the phone service. 1. Unplug the phone line from the jack in the NIB. 2. Find the orange and white pair of wires from the bunch. 3. Connect the white (white with orange) to the Green terminal and connect the orange (orange with white) to the Red terminal. *** The L2 terminals are above the L1 (already connected) in the picture....correct??? 4. Then disconnect the blue and white wires from the L1 terminal. 5. Then plug the phone line back into the Jack. 6. Using the designate splitter, plug the DSL Modem in to L2 port and verify that I still have Internet connection. 7. Once internet is verified, I can clip the exposed metal ends on the Blue and White wires (to insure they do no accidentally connect/touch anything), and close up the NIB. 8. Hopefully, I can then connect the Ooma "phone" port to the L1 port of the splitter and I will get a dial tone throughout the house!!!!! 9. Set the DTV DVR receiver to dial out with prefix *99 and put a DSL filter between receiver and wall jack to maximize successful dialout. By the way, what are the references to the black and yellow? Are they the color of the wire running from L2? Last edited by Nolzman on Thu Dec 16, 2010 11:34 am, edited 2 times in total.